Gulfside Elevator takes pride in manufacturing, in house at our Naples facility, our vibration-free submersible hydraulic pumping units. In a hydraulic application, the pumping unit is located in a space outside of the elevator hoistway, such as a dedicated machine room, in a closet, under stairs or in a garage. Locating the pumping unit outside the elevator hoistway makes for simple and safe access during scheduled maintenance along with eliminating the disturbance from any machine noise within the elevator car, which can be found with other models. With the minimum overhead of only 7’-8” and a minimum pit depth of 8” (12” recommended), Gulfside Elevator’s hydraulic units can fit in some of the most challenging spaces. Gulfside Elevator’s Roped Hydraulic Home Elevators are proven to be Southwest Florida’s most popular model due to their quiet and smooth ride. All lighting in our elevators are of energy-efficient LED technology. Our roped hydraulic home elevators are furnished with two 3/8″ diameter hoist ropes and an instantaneous car safety that is activated by slackening in any single hoist rope. Gulfside Elevator provides and places door interlocks on all existing hall doors so that the hall door cannot be opened if the elevator is not at that floor. 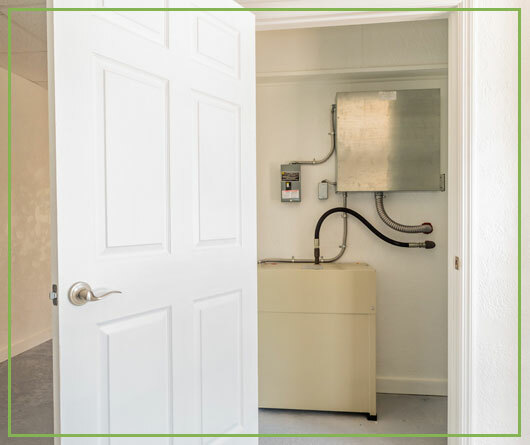 As a standard feature for homes in low lying and coastal areas where the ground floor is below flood elevation Gulfside Elevator installs a pit float switch; when activated by water the pit float switch will send the elevator to the designated floor above the flood elevation. All elevator models at Gulfside Elevator have built-in emergency lowering systems which allows for the elevator to safely descend to a lower floor level in a power outage. All of our safety devices are tested and certified in accordance with the American Standard of Mechanical Engineers (ASME A17.1) Safety Code for Elevators.